← What is at stake in the Romanian Protests? On a May evening six years ago, standing close to the venue where the opposition’s MPs are on strike, darkened by the night and time, solitary and pensive, Edi Rama looks as if painted by some Neue Sachlichkeit artist. “You have a weak handshake” – he tells me and shows how a handshake is supposed to be. For the then 19-year old me, he is an artist, the leftist that has to be a Prime Minister. Indeed he does but nowadays the artist surfaces here and there, whereas the leftist is nowhere to be seen. During the first years that followed the collapse of the communist regime, a young Rama wrote a series of editorials that condemned the Berisha-led government, although as an intellectual, he was careful to distance himself from the former (socialist) regime. In “Reflections”, the book co-authored with Ardian Klosi, he denounced the Albanian resistance organization (LANÇ) that fought during World War II, as having participated in a civil conflict that prevented Albanians from have a say on the provisional government that was elected. This claim, along with his involvement in the anticommunist movement and his conviction that the Socialist Party should condemn the legacy of PPSH (Albanian Workers Party), made of Rama a rebellious figure but one that stood out more for his anti-communism rather than his leftism. 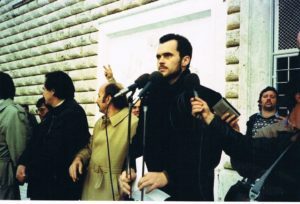 It was during the course of the turbulent year of 1997, when he was physically attacked (very likely by the secret service) that his opposition became defined ever more firmly as leftist, merely because it opposed the capitalist madness that had consumed both the Democratic and the Socialist Party, and which oversaw the systematic privatization of large state owned companies. In the arc of one year, in 1998 Rama became a Minister of Culture in the Nano Cabinet, which created a platform for him to capture public attention with his flamboyant ways. As a mayor he demolished illegally constructed buildings and restored public spaces but failed to address acute issues such as housing or the privatization of city services. By the time he came to power in 2013, it is no exaggeration to say that he was a mature politician that had toured Albania from North to South. A tour that in retrospect was scarcely overestimated by the electorate and regrettably, in a cyclic approach, turned out to be just a subsidiary activity of his electoral campaign, instead of being a genuine effort in understanding their struggles and change anything. “I dragged Tirana out of the filth”, he would boast in a late night interview, probably hinting at the time, ten years earlier, when as the Mayor of Tirana he ordered the painting of the facades of a couple of buildings with vivid colors. Traveling through the city one realizes that colors are not eternal. Here and there they have started to peel off the walls, and the buildings have started to look as shabby as if they were leaking out of a Jodorowsky film. When Anri Sala, an Albanian artist shot “Dammi i Colori” (Give me the colors)’- an artwork that heralded the ineptness of the city to cope with its future purpose, at that time, the propagandistic subtleties of its visual rhetoric were easy to ignore, as the public had yet to learn that it was not only in the old regime that art met ideology and backed up political agendas. That made artistic life a heavily regulated space, in which the Party dictated the aesthetic directions. Rama, however went one step further and exploited art and artists to alter the looks of a town mired in poverty and precarity. Not more than a decade later, along with painted buildings, facades, and a sculpture planted in front of the government building, a hasty ‘desir d’occident’ is coming into sight. “I successfully led Tirana from a vulgar oriental bazaar to a story of success” – he adds proudly, associating the absence of the oriental with success, emphasizing that the non-western vulgarity is ill-fitted with it. Rama is not alone in attempting to give the capital a facelift. The Government of the Republic of Macedonia funded “Skopje 2014”, a project estimated to have cost its citizens up to 600 million euros, and which ultimately flattens all preexisting architectural presence in the name of a more classicized and oppressive look, evoking the grandeur of Alexander the Great. In other words “the middle class gentleman” complex of the ruling political class, is a characteristic of the region, a pathological attempt in occidentalizing the respective country. An attempt that indicates a profound crisis of identity that claims a western reality in the region that is not and never was. Rama’s predisposition and penchant for the west is however not a recent manifestation. One of the students’ demonstration slogans in the 90s was “We want an Albania like Europe!”. When voiced by the students it expressed the yearning for substantial political and social change; when expressed in a politician’s rhetoric, it translates to promoting competition and neoliberal policies, ignoring the fact that our economic development can’t afford either. This “desir d’occident”, is costing us, Albanians, a lot; not in terms of cultural arrogance (“if everyone likes it, then it’s mediocre”, the prime minister would say in the same interview) but in terms of the cost that is needed to fuel the manifestation of this arrogance in the realm of the everyday. For example, the government spends money on beautifying cities, renting and buying artworks, but can’t afford to buy an MRI machine to diagnose tumors in a regional hospital like that of Pogradec that serves a population of 61.000. Leaving patients who suffered a brain hemorrhage or thrombosis to be cured blindly, until they are able to travel one hour through a mountainous road to the nearest hospital. In these terms, Rama’s visionary outlook of altering the public artistic space are indecent and unethical, especially if this alteration is the extension of a whim of those in power. The Center for Openness and Dialogue, is a material symbol of this. Located in the first floor of the Prime Ministry’s building, it echoes the ambition to influence the development of the artistic space through political structures. Rama of course is not the humble Pepe Mujica, the Uruguayan president who turned the presidential palace into a shelter for homeless people and kept living in a farm on a minimum wage. Improvement for Rama is symbolic and has nothing to do with the satisfaction of collective needs. 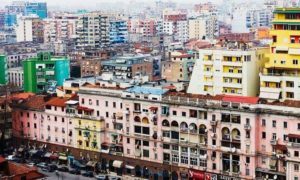 The Albanian capital of Tirana and the coloured facades that date back to Rama’s time as mayor. Although traditionally the left has fought to render political power impersonal, Rama during his time as a PM has sought to associate his name, his personal reflections and individual narrative not only with the Socialist Party but also with the government he leads. What Milva Ekonomi, the Minister of Economy, said in a public discussion with students reflects this: “the brand Albania has is called Rama”, and that “wherever he participates in an international meeting, because of his ideas and discussions, he makes a remarkable impression. He has the globe on his mind, and he knows how to use the knowledge in his head.” Even if one ignores the vulgarity of the comment, it’s impossible to ignore the larger context from which it is derived, that is that of the collision between the state and the individual that abuses his political power in order to establish a personal cult perpetuated by those who patronize his power. Today’s Rama is unfortunately turning into an arrogant, authoritative figure, that runs the country as Citizen Kane ran his newspaper. But while Kane’s was a personal and capitalist venture, Rama’s is not. Nor is it an appropriate canvas on which to develop one’s personal artistic work. As a Prime Minister, he shouldn’t be abroad promoting expositions that bear his name. He was elected on the premises of his then leftist position: fighting economic disparities, reforming education, improving health care and halting exploitative working conditions. In his haste to come up with an effortless change, Rama resorts to a kind of illusionary improvement, which evades the most difficult tasks. In so doing, he is throwing the country deeper in poverty, following his desires and forgetting his duty. His immediate duty, and that of his political entourage extends far beyond the realm of art. No matter how well meaning their intentions, politicians should keep their distance from art, when in office. Historically when they meddled, it degenerated into propaganda. Pablo Picasso once remarked that “If art is ever given the keys to city, it will be because it’s been so watered down, rendered so impotent, that it’s not worth fighting for”. In my understanding, it’s not that propagandistic art can’t be great art, but that to use it as a measure of change, borders on the ridiculous, especially in the social and economic conditions in which Albania finds itself today. Referendum Interrupted: Has Catalonia a .. The times they are a changing: Rebuildi ..
Griselda Qosja is an Albanian writer and columnist, based in Germany. She is a PhD candidate at the Europa-Universität Flensburg (EUF) researching on European Constitutionalism. Her other interests intersect labour law, immigration and gender studies. Sali Berisha lead the Albanian Democratic Party for about two decades. Throughout the course he served as PM and President, pyramid schemes flourished, many national infrastructures were sold to foreign firms for less that their value subjecting him to accuses for endemic corruption. In this context Rama’s political figure has been in an everlasting antagonism with Berisha’s, entangling both in a harsh and often personal dispute, even before Rama took the lead of the Socialist Party. Afterwards often overheard in the Democratic Party’s rallies. E duam Shqipërinë si gjithë Evropa!